Amy Levy was born to a large Anglo-Jewish family. Her admirer and editor Oscar Wilde said that as a young adult, she "ceased to hold the orthodox doctrines of her nation, retaining, however, a strong race feeling." She began writing at a young age. At 13, she wrote a criticism of Elizabeth Barrett Browning's Aurora Leigh; and at 14, her first poem "Ida Grey: A Story of Woman's Sacrifice," was published in the journal Pelican. She was a boarder at Brighton High School for Girls, a school founded by women’s rights advocates. 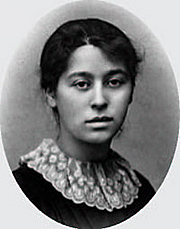 In 1879, Amy Levy became the second Jewish woman to attend Cambridge and the first at Newnham College. After leaving Cambridge, she traveled back and forth between Europe and London. Her circle of literary friends included Clementina Black, Eleanor Marx, and Olive Schreiner. Amy Levy wrote poems, novels, stories, and essays for periodicals; many of her works reveal feminist concerns. In 1886, Amy Levy began writing a series of essays on Jewish culture and literature for the Jewish Chronicle, including The Ghetto at Florence, The Jew in Fiction, Jewish Humour and Jewish Children. Her final book of poems, A London Plane-Tree (1889), contains lyrics that are among the first to show the influence of French symbolism. Spending the winter of 1886 in Florence, Amy met and fell in love with Violet Paget, a writer who used the pseudonym Vernon Lee. Amy Levy's second novel Reuben Sachs (1888) was heavily criticized by the Jewish press. She had suffered from episodes of clinical depression from an early age and was growing deaf. These factors may have led to her suicide at the age of 27. Amy Levy is currently considered a "single author." If one or more works are by a distinct, homonymous authors, go ahead and split the author. Amy Levy is composed of 1 name.